In Manchester city centre, homelessness is common. Less common are arias and less common still choruses of performers who have experienced homelessness singing Bach. Taking place in Manchester’s Campfield Market, The Passion is the culmination of a year-long collaborative programme of workshops between The Sixteen and Streetwise Opera. An abridged staging of J.S. Bach’s St Matthew Passion, the opera begins with the chorus entering in the back of a truck and crossing the space through the congregated audience in thick outdoor coats and woollies. 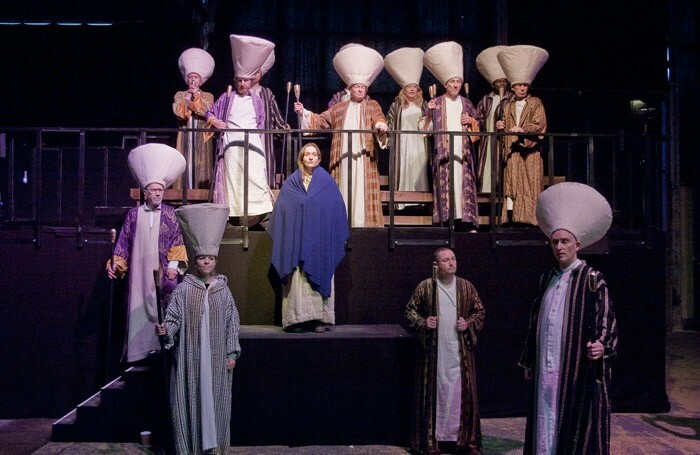 These clothes are soon swapped for more traditional signifiers of Roman Judea: robes, shawls and a choir of Pharisees. The role of Jesus is shared between multiple performers throughout the performance, the music combining with Imitating the Dog’s artful live projection and light direction and the Victorian ironwork of the market. Though abridged, Bach’s masterwork loses none of its potency; tenor Joshua Ellicott unfailingly carries the narrative with standout performances also coming as Jesus is sentenced to death on the cross, from Kirsty Hopkins’ soprano and Alexandra Jakeman’s flute on the Aus Liebe will mein Heiland sterben aria. The finale takes the form of a new composition by James MacMillan, with libretto written by the Streetwise Opera Manchester Explore Group: a joyous resurrection capping a production which provides solid evidence that social outreach need not exist solely at the fringes of the arts.